DISCLAIMER: Crystal Allies and its agents will not be held responsible for any claims for injuries, damages, or losses resulting or connected with the use of the Himalayan Salt Lamp. Our company and its agents will not be held responsible for any and all liability related to mishandling, improper use, or unintended applications of the Himalayan Salt Lamp. Information provided by Crystal Allies is for educational purposes only and is not intended to prevent, diagnose, or treat any medical condition or disease. Not for human consumption. Quantity: Set of 1 Salt Lamp w/ 6ft UL-Listed Cord, 15-Watt Light Bulb, and Authentic Crystal Allies Certified Stone Info Card! 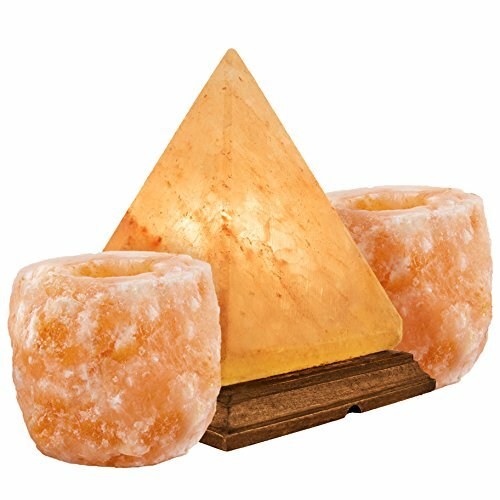 Lamp Size: 5.5" x 5.5" & Candle Holder Size: 3" x 3" x 2"
100% ALL-NATURAL HANDCRAFTED: Himalayan Salt mined from natural sources. Each pyramid-shaped salt lamp is unique and you will receive one similar to image shown. Neem wood base. Includes authentic certified pamphlet. If you have any questions about this product by Crystal Allies, contact us by completing and submitting the form below. If you are looking for a specif part number, please include it with your message.